In a study presented at the annual meeting of the Radiological Society of North America earlier this week, researchers believe they've found proof that violent video games alter the portion of the brain responsible for controlling emotion and aggressive behavior. How many times are we going to prove this? For a while there it felt like a new study linking violent video games to aggressive behavior in our children was being churned out on a regular basis, each one claiming to be more conclusive than the last. This latest study, conducted by researchers at the Indiana University School of Medicine, is the latest to provide concrete proof that scientists really enjoy proving things. "For the first time, we have found that a sample of randomly assigned young adults showed less activation in certain frontal brain regions following a week of playing violent video games at home," said Yang Wang, M.D., assistant research professor in the Department of Radiology and Imaging Sciences at in Indianapolis. "These brain regions are important for controlling emotion and aggressive behavior." 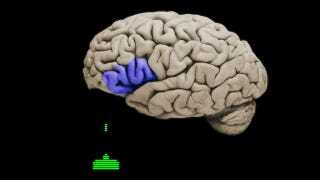 Utilizing a functional magnetic resonance imaging machine, researchers scanned the brains of 22 randomly-selected young males aged 18-29 while the subjects completed an emotional interference task, pressing buttons according to the appearance of colored words, some aggressive, some soft and cuddly, as well as a cognitive counting task. The 22 men were then split into two groups of 11. The first group played a violent shooter for ten hours over the course of the week. The second group did not. After the week was up, brains were scanned anew. Researchers discovered that subjects that had played the violent shooter game showed less activity in the left inferior frontal lobe during the emotional task, as well as a drop in anterior cingulate cortex activity during counting. The study also found, however, that the effect diminished after the gaming group spent another week without playing the violent shooter, so I suppose it all depends on your definition of long-term. I'm not going to argue the science behind this study, as it draws a rather solid, if predictable conclusion. I was just under the impression that every little thing we do has some sort of an effect on the great big bundle of nerves in our head, so why should violent video games be any different? What I'd really like to see is the study expanded to include movies, television shows, music, and even violent novels. I know violent content will alter the way I perceive violence; what I want to know is if video games have a stronger effect than any other form of entertainment.